The Russian market has started the current year with a relevant acceleration of the Technical Consumer Goods sales. As reported by GfK Temax, in the first quarter of 2018 products of this sector expanded by 17.6 percent, compared to the Q1 2017. With the unique exception of photograph area, that saw a decline by 4%, all the other segments increased from 4% to almost 10%. Major domestic appliances closed the first three months of the year with a growth of 6.8%, thanks to the good performance of washing machines (consumers continue to abandon models with small depth in favor of slim and standard) and built-in segment, in particular for cooking and dishwashers. An important increase was recorded also by small domestic appliances, that grew by 10.8%. The best-sellers were garment steamers and men’s shavers and epilators, which has been declining during last 2 year, but finally managed to recover to stable development. Maybe thanks to Russia 2018 Football Championship PTV gave a contribution to reach the +9.7% trend of consumer electronics market, that registered slight growth driven by growing demand for these appliances, especially for the segment of 43” screen size an 49”-65”. Audio Bluetooth speakers continue to be the fastest growing segment of the music market, while demand for car audio segments is declining. 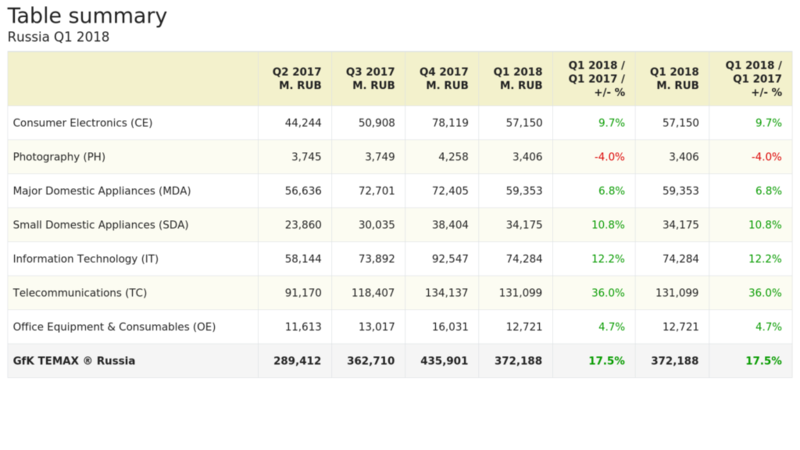 The most growing segment in the Russian market of TCG was Telecommunication, with the incredible increase of 36% during the first three months of the year: key growth drivers were smartphones with bezel-less screens (>0.74 screen to body ratio), which started to see mainstream adoption in 2017. Regarding Information Technology, finally, growth drivers were still in gaming products, advanced segments and productivity. IT peripherals market trend was following the computing one: monitors, storage, keyboards, routers, surges grew up in Q1 as a logical continuation of the Desk and Mobile PC market recovery.